Botany is addictive. As a kid growing up near the western foothills of the Sierra Nevada mountain range, I took numerous summer camping trips to the forests where I loved trying to identify every kind of tree and wildflower I saw. I would religiously consult the plant pictures and descriptions in my copy of T. Storer’s Sierra Nevada Natural History, the classic guide for anyone exploring California's most glamorous mountain range. Now as a graduate student in the research department at RSABG I am still fascinated with native plants. I am currently working on a floristic inventory of the Rock Creek drainage in Inyo National Forest on the eastern side of the Sierra Nevada, about 50 air miles southeast of Yosemite National Park. On a topographic map the upper Rock Creek watershed appears as an eggplant-shaped hollow about 30 sq. miles in area, surrounded by steep granite ridges and peaks, many reaching 12000 feet and higher. In the course of my research I have found there is little documentation about the biodiversity of the high mountain summits around Rock Creek, which are physically challenging to reach. I'm inspired by the work of botanists whose insatiable curiosity has led them on searches for plants in wild remote places. Long before before I was born, an accomplished botanist named John Thomas Howell made a challenging climb up a high mountain in the Rock Creek drainage that had no record of previous botanical exploration. Howell—who earlier in his career had been the first botanist hired on staff at RSABG—described the flat-topped mountain as a “sky island” looming high above Rock Creek Lake. It had no geographic name, so he called it Mono Mesa. He originally saw it while on a botanical collecting trip through Mono Pass. Howell climbed to the top of Mono Mesa in July 1946, collected representative samples of as many different plants as he could find, and shortly thereafter published a list of species. He found 73 taxa, which he considered an impressive number for a high summit with ¼ sq. mile of land area. Howell recounted his fascination with the barren yet beautiful landscape he described as a “velvet-textured monotony.” He wrote that Mono Mesa was unusual, that unlike the surrounding jagged ridge tops it had never been glaciated, never changed by eroding effects of melting and moving ice. Sixty seven years later in summer 2013 I stood at our base camp at Summit Lake near the top of Mono Pass, impressed by the monumental view of Mono Mesa rising into the sky two miles to the north. I contemplated my quest to resurvey the mesa, which had been many months in planning, preparation and no small measure of uncertainty. Local folks in the Rock Creek valley had assured me that a day hike to the summit (12260 ft.) was very doable but there seemed no clear consensus on which route was best and no established trail to follow. We set out from camp the morning of July 12, a two-person team consisting of myself and RSABG colleague Travis Columbus. It took us several hours to make our way cautiously along a narrow knife ridge of piled boulders leading up to the mesa edge and after many heart-pounding moments negotiating our way around gigantic boulders and sheer drop-offs we arrived at the summit in early afternoon. I spent the remainder of the day collecting plant samples, recording GPS data and taking field notes as we surveyed the wide plateau. I was struck by the barren expanse of sandy rocky plain, practically devoid of trees and shrubs except for a few small, scraggly whitebark pines (Pinus albicaulis) clinging to the south rim. 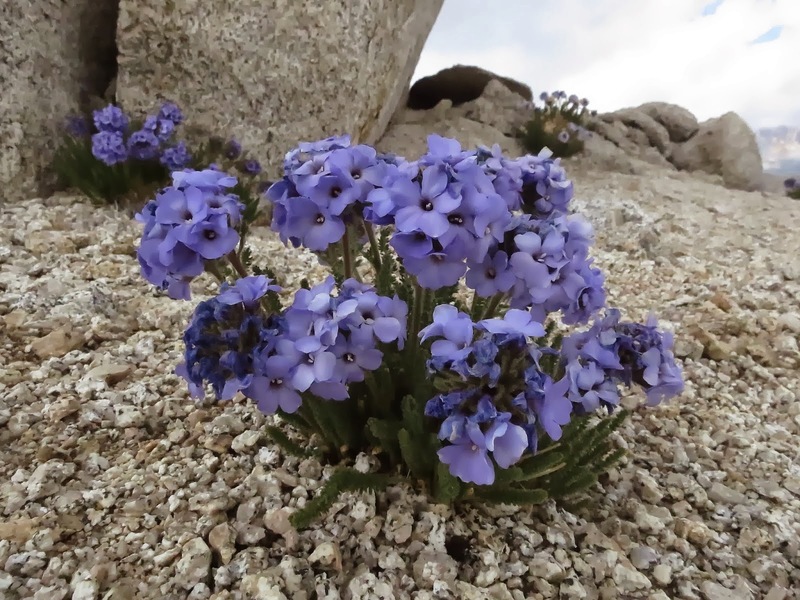 A closer inspection revealed an assortment of small colorful plants with cushion- or mat-like growth forms, hugging the ground or sheltering under lichen-covered rocks as if to take refuge from the unforgiving alpine environment. Plants have to be tough survivors up here. Many species I happily observed still thriving on Mono Mesa decades after Howell documented them, including Davidson’s penstemon (Penstemon davidsonii), alpine gold (Hulsea algida), dwarf alpine Indian paintbrush (Castilleja nana) and sky pilot (Polemonium eximium): arguably the flashiest most charismatic alpine plant that only grows in the Sierra Nevada. My curiosity to resurvey the mesa was especially keen because of the potential impacts of climate change. 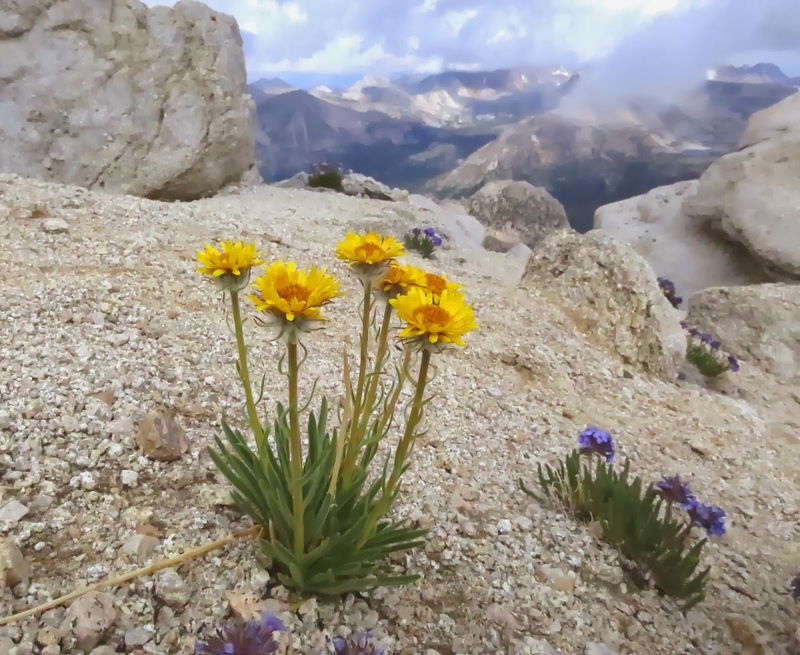 Warming temperatures are a significant threat to alpine plant communities especially on the highest summits where plants cannot disperse any higher to find cooler microclimates. Perhaps there are species still unknown to science persisting on Mono Mesa and atop other Sierra sky islands where the chance of discovering them is getting slimmer as the climate warms. It was an unforgettable experience seeing the wonderful flora of Mono Mesa; hopefully my ongoing work to identify the plants I collected there will contribute to understanding life on these magnificent islands in the sky.